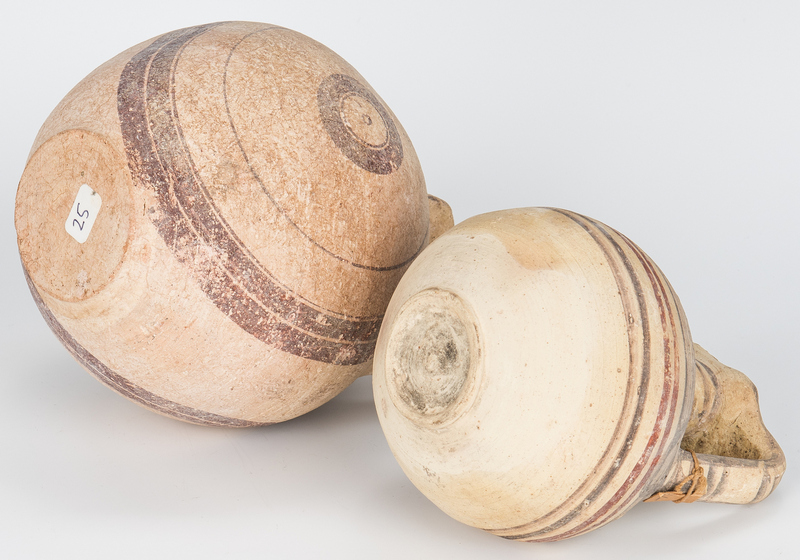 Three (3) Cypriot Bichrome Ware pottery items. 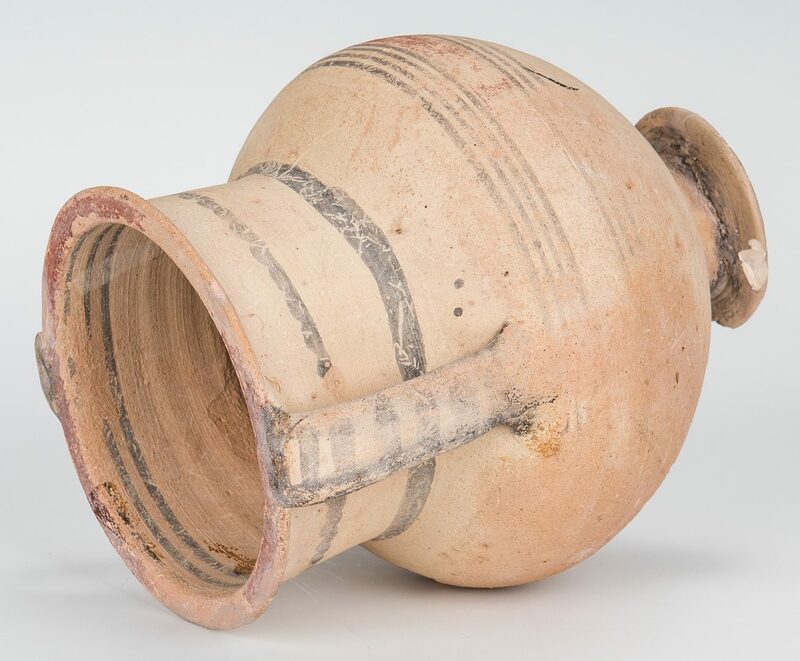 1st item: Pitcher with trefoil spout and vertically oriented circle designs on the body, flat base. 7 3/4" H x 6 1/8" dia. 2nd item: Pitcher with trefoil spout, one handle, and painted banded design and circle pattern on body, flat base with slightly raised foot. 6" H x 4 3/4" dia. 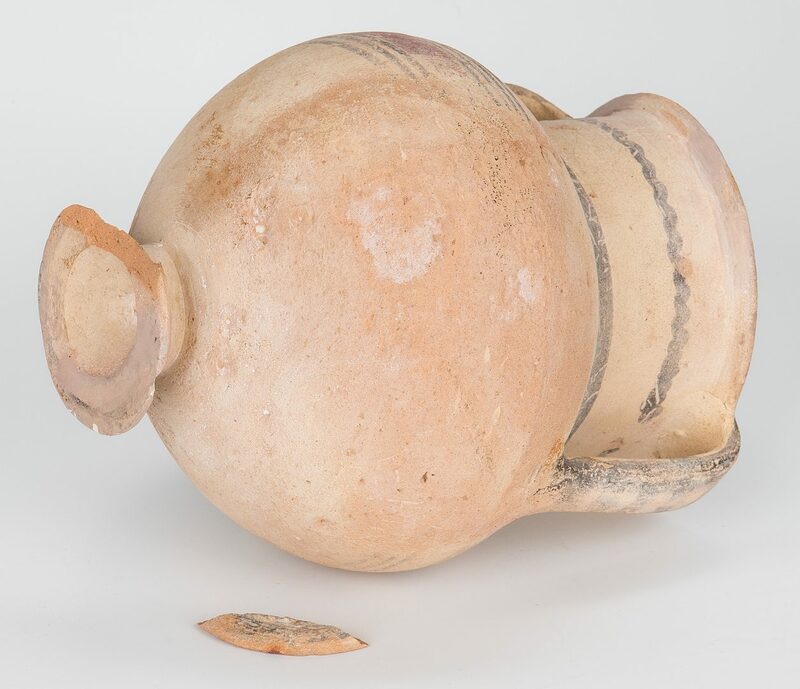 3rd item: Amphora with two handles and banded designs on neck and body, small, flat foot with pontil mark to underside of base. 7 1/8" H x 5 3/4" dia. 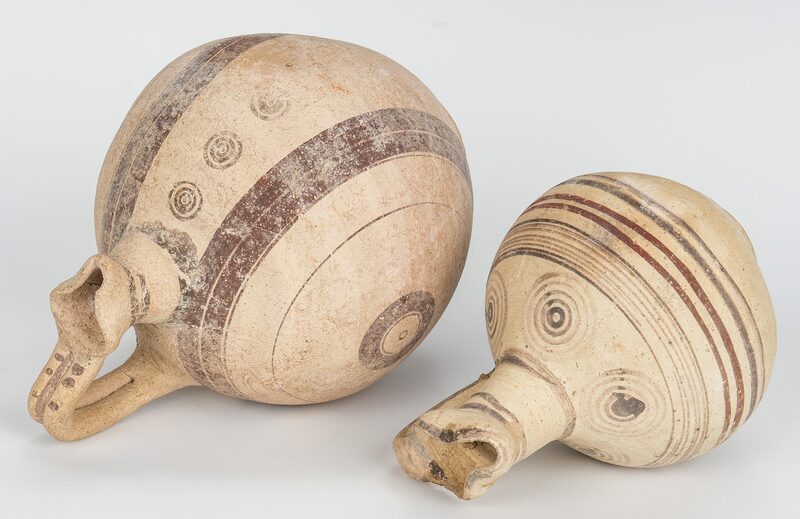 All items Iron Age, Cypro-Geometric to Cypro-Archaic period, circa 1050-600 BC. Provenance: Estate of Martha Lyman, Dayton, TN. CONDITION: 1st item: Moderate overall abrasion consistent with age but painted/glazed decorations to the vessel remain visible with slight fading. Old sticker label on the base. 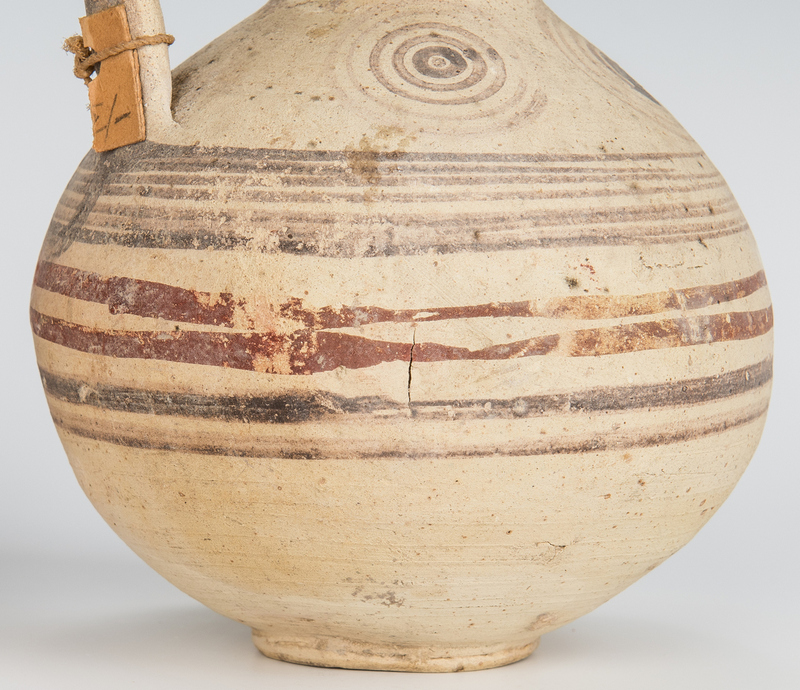 2nd item: Minor overall surface abrasion consistent with age and slight fading to painted design. Accretion of grainy but clear substance on the spout where handle connects and spots on neck. 1 1/2" long indent on body along red decorative banding which has a 1/2" long hairline crack down its center. 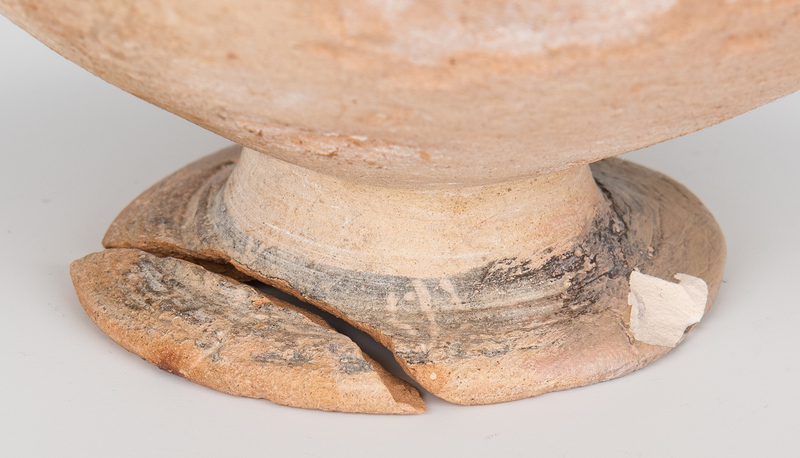 3rd item: Moderate overall abrasion to the vessel consistent with age with a more affected area interrupting the banded design on the body for roughly 3". Areas of restoration to rim and base, largest being 2 1/2" on the base. Base has 2" chip but we have this missing piece, which has a sticker attached. Some darker areas fluoresce on rim and body but are patchy and tape-shaped, with the largest being 2" on the body.